1. Am I a good candidate for facelift? 2. How will my plastic surgeon evaluate me? 4. Where are the incisions placed? 6. How should I prepare for surgery? 7. What will the day of surgery be like? 8. How will I look and feel initially? 9. When can I resume my normal activities? -a deep line, or fold, running from the corner of your nose to the corner of your mouth. 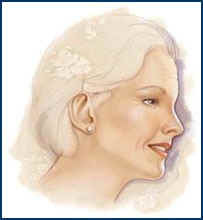 -jowls, or loss of a well-defined jawline associated with youthfulness. -deep wrinkles in the cheeks and sagging of the "highlight" areas of the cheekbones. 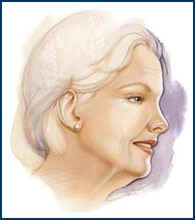 -loose skin, wrinkles, vertical "cords" or excess fatty tissue in the neck.